This new lifetime replacement 85W Magsafe 2 Charger made by Top AC Adapter (not original apple product) is compatible with all Apple MacBook Pro with 15"" Retina from mid 2012 models and onwards. This Apple 85W alternative Magsafe 2 charger features a magnetic DC connector to prevent frayed cables and broken connectors. The T-style connector tips fit all MagSafe 2 MacBooks. 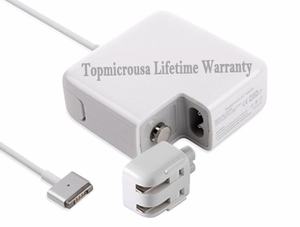 Our compatible replacement 85W Apple MacBook MagSafe 2 Power Adapter Charger features a Lifetime Warranty and Free Shipping. For all other Apple laptop part numbers, mid 2012 models and onwards, we recommended our Apple 60W Magsafe 2 Lifetime Charger.